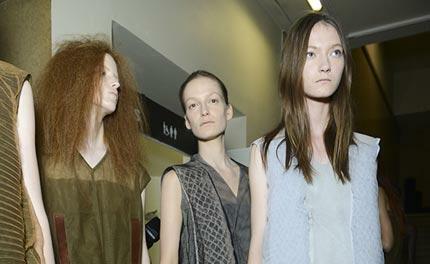 In the bright world of flash-bulb fashion, Rick Owens is the king of darkness. So it was shocking (and relieving) to see his fashion show set not in the dark underbelly of a remote sports arena, but inside the pastel-frescoed walls of Paris' Place du Trocadéro. Just as pure light shone through the huge windows of his venue, so too did Owens draw back the blinds on his usually pitch-black, moody clothing. The effect was translucent and intriguing. Owens worked almost exclusively in transparent tulle, which he layered, ironed, and crimped into complex honeycomb or patchwork configurations. The models' bodies got in on the act; many of which were painted ivory, like an aboriginal tribe. That too, felt very much on point. While most designers might treat a prim material like tulle in a sweet, romantic way, Owens twisted it into something primitive. As for his Grecian sandals? They featured enormous jaw soles that clonked along the floor as if carved from granite with the models walking on top of them like a big band of couture cavewomen.